Even with limited materials you can make some interesting creatures. 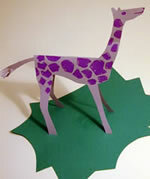 Here are some ideas for animals you can make using construction paper, a glue stick, and markers (with some play dough and sticks for support). An assortment of art supplies: play dough, craft sticks, straws, pipe cleaners, etc. To make this creature, I made a tube out of paper, then cut into the tube at an angle to make the neck, and folded down the end of the strip to make the head. I thought of this as an alternative to using toilet paper tubes for art projects. 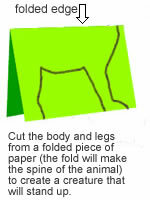 Try folding long strips of construction paper back-and-forth (accordian folds) to make springy legs, necks, tails, etc..
To make this giraffe, I first cut the body and legs from a folded piece of paper, then cut the head and neck and added a tail. 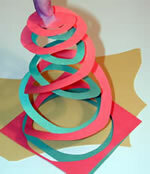 You could also try making bouncy spirals out of cut paper. 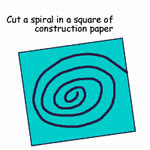 This cool shape is made from two spirals coiled together. Tim was inspired by news stories about the snakehead or "frankenfish," a non-native species that can live out of water for 3 days and can catch and eat rats. A wonderful addition to any park. He decided to make an expanding fish. Here's a diagram of how Tim made the Frankenfish. He made cuts into a long sheet of paper first from one edge then the other. (He made curved cuts that look like fish scales.) Make sure not to cut quite all the way across.